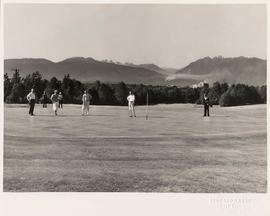 Photograph depicts seven golfers standing on the green at the Shaughnessy Golf and Country Club.Seven men standing on golf green; fairway in foreground; wooded area and North Shore mountains in background. Photograph depicts Shaughnessy Golf Course.Landscape showing golf green with sand traps in front and trees surrounding sides and back; Tudor style structure visible through trees in background.Labeled 16368 in bottom right corner. Photograph depicts golfers on path at Shaughnessy Golf Club.Two men and one boy on dirt road with white guardrail; clubhouse structure in background of image. Photograph depicts Shaughnessy Golf Course.Landscape showing foliage and rough grass area in foreground; golfers walking on fairway with trees and sand traps to left.Labeled "16379" in bottom right corner of image. 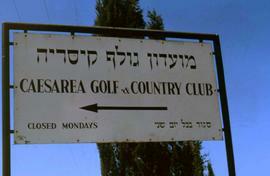 Colour Kodachrome 35mm slide depicts a sign which reads "Caesarea Golf & Country Club." Colour Kodachrome 35mm slide depicts a sign for the Rotorua Golf Club. Colour Kodachrome 35mm slide depicts a group of men and a young boy standing on a golf course. Colour Kodachrome 35mm slide depicts three unknown men walking on a golf course with a fourth man walking separately on the left of the image. There is a golf pull cart in the right lower corner and a red flag in the background.